This page deals with carriages used on the original Welsh Highland Railway WHR and its predecessor the North Wales Narrow Gauge Railways (NWNGR). WHR Carriages deals with carriages used on the modern Welsh Highland Railway (WHR) since 1997. WHR Ltd Carriages deals with those carriages of the Welsh Highland Heritage Railway (WHHR). All of the carriages owned by the Welsh Highland Railway from its inception in 1922 originated on the North Wales Narrow Gauge Railways, (NWNGR). When these carriages passed to the WHR they were renumbered in a common series with the Festiniog Railway. WHR carriage numbers started at '23', following on from the second of the two F.R. Ashbury bogie carriages, number '22'. According to contemporary reports, eleven carriages remained at Dinas in 1922. The NWNGR had acquired carriages as follows: for the opening in August 1877 - two Brake 1st/3rd composites from Ashbury and three four-wheel carriages also from Ashbury; December 1877 - three six-wheel carriages to Cleminson's Patent design from the Gloucester Carriage and Wagon Co.; 1891 - the "Workmans" and the "Tourist" (later known as the "Gladstone") bogie carriages from Metropolitan; 1893 - two "Corridor" bogie carriages from Ashbury; 1894 - four "Summer" bogie carriages (two semi-glazed and two un-glazed) from Ashbury; 1897 - a possible bogie carriage to replace the three 4-wheelers (from Ashbury ? - see Note 9); 1907 - two Brake 1st/3rd composites from R.Y. Pickering to replace the two Gloucester Passenger Brakes (Cleminsons); a maximum sixteen at any one time. The Directors reported in 1879 that the whole of the rolling stock was hired - the NWNGR had apparently acquired it on hire purchase, but rentals had fallen behind, and some of it, including the three six-wheelers, were taken over by James C. Russell and sold to the Moel Tryfan Rolling Stock Co. Ltd. which he had set up with fellow Directors to protect his investment in the Railway, until 1880, when it was sold to the Railway in exchange for Debentures. The numbering of carriages in NWNGR ownership is not completely clear and it has been postulated that there were two re-numbering exercises in the early 1890s. It would appear that interim numbers were applied to some vehicles as the system was changed over from the original sequence to that which was used through to the formation of the WHR, when surviving carriages were renumbered in a common FR Co./WHR number sequence. A good deal of the evidence comes from photographs, the surviving 6-monthly accounts presented to shareholders 1881-1918, Board of Trade correspondence and Court Documents. But the latter sources are sometimes confusing at best, and suspect at worst. For example, the Carriage statistics in the accounts and Board of Trade returns appear to ignore the withdrawal of the 4-wheelers in 1897, not corrected til 1909. And on 13 June 1892 Russell wrote to the Board of Trade saying that 'four (altered from five) 8 wheeled Bogie Carriages have been fitted, and a fifth will be, with Westinghouse Brake'. The other evidence suggests that there were only four bogie carriages at this time, the 2 new 'corridor' coaches not being approved by the Court until the following March. Correspondence with B.o.T records 3 4-wheelers. One of them was exhibited in Manchester on 1 May 1876 by Ashbury, the makers. The report of the B.o.T after an accident at Snowdon Ranger in 1883 records 4-wheelers Nos '3' and '5' being involved and a well-known photograph shows all three - the other one, logically, would have been No '4'. The Carnarvon & Denbigh Herald (weekly, published on Saturdays) of 22 December 1877, reporting on the 10th half-yearly meeting of NWNGR shareholders, noted: "Two composite carriages, 2nd and 3rd class with break compartment, and one third class carriage, each 30 feet long, were added this week, to supply a great want." These were the 6-wheeler carriages to Cleminson's patent. (they were added to the stock totals in 1878) The system was described in Edouard Vignes' 1878 publication "A Technical Study of The Festiniog & Other Narrow-Gauge Railways". A letter from J C Russell to the B.o.T of June 1892 confirms that "there are three 6-wheel carriages . . . two of these have brakes and brake compartment, one has not". Several photographs show all three in the same train. The report into the 1883 accident at Snowdon Ranger noted that in the train was Carriage No 6 "six-wheel composite carriage with break compartment". Carriages '6', '7' and '8', (without a description) were listed amongst rolling stock hired to the railway in an agreement with the Moel Tryfan Rolling Stock Co. Ltd of December 1878 until 1880 when Debentures were issued by the railway to pay for them and outstanding hire fees. J.I.C. Boyd stated that Nos '6' and '7' were the composites and No '8' the third,  but the source for Nos '7' and '8' is not known. The attribution in the table follows Boyd, but is therefore, in this respect at least, speculative. When the two carriages from Metropolitan were acquired in 1891 and were allocated the numbers '7' and '8', the number conflict was temporarily resolved by re-numbering the Cleminsons as '9', '10' and '11' . In these notes, Michael Bishop observed that upon the acquisition of the 'Corridor' and 'Summer' carriages, further renumbering would have been necessary. There is photographic evidence from 1896 showing a Cleminson Brake carrying the number '5', indicating that a second renumbering did take place . Analysis suggests that this second renumbering allocated the numbers '4', '5' and '6' to the Brakes and the All-3rd respectively. The 26ft "Closed Coach" was described by its manufacturer as a "Workmans Carriage". All windows were glazed and there was no internal connection between the two halves of the car. The seating was arranged peripherally around each of the two compartments. 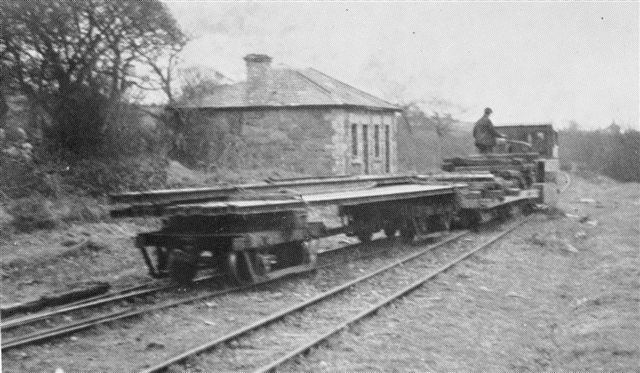 The carriage appears in a photograph taken at Dinas published in the WHR section of Boyd's book  suggesting it was taken in 1922 or later, credited to G.M.Perkins, but it had been published in an earlier version  in the NWNGR section captioned c 1909, along with a photograph of Gowrie by Perkins in 1909. It was not retained for use on the WHR. It is possible that some of its timber was used in the 1927 Buffet Car conversion. The 26ft "Tourist Coach" had a glazed central section and commodious open end sections (referred to sometimes as "balconies"). The original Metropolitan plans and the half-yearly accounts at the end of 1891 suggest that initially it was considered a Composite (2nd inside and 3rd outside ?). But the accounts 6 months later create a "Tourist Car First Class" vehicle at the expense of a Composite. This suggests a conversion, maybe to cater for an increasing tourist trade, but it is also possible that this was in anticipation of Prime Minister Gladstone travelling in it during a visit to Edward Watkins' chalet in September 1892. The well-known photograph in this guise as No 8 comes from Mackay's 'Light Railways' of 1896. In WHR days it was the only carriage whose roof was not lowered and it seems to have been known as the OBSERVATION COACH rather than carrying any number. It was dual-braked between May 1923 and Spring 1924. The 30ft "Corridor Coaches" were so known because there was internal communication throughout; they did not have external corridor connections. All windows were glazed. They were perhaps the first British ordinary carriages for any gauge to incorporate this general "modern" layout. No. '10' was altered in the late 1890s to incorporate a central partition, with door, and a 1st class saloon in one half. It, as WHR no. '24', was further altered in 1927 to incorporate a buffet in the erstwhile 3rd class section, and, at some time before 1934, it was altered again back to a 3rd class saloon. The "Summer Coaches" were more spartan compartment vehicles, 29ft 11ins in length. '13' and '14' had no glazing and half-height doors while '11' and '12' had half-height doors with the upper section between each door glazed. No. '12', which had become WHR '24', was passed to the FR at the end of 1926, becoming their no. '23'. Second Class was abandoned at the end of 1893  and these carriages ceased to be Composites, becoming Brake All 3rd. The numbers allocated to the "Workmans" ('7') and the "Tourist" ('8') had previously been allocated to two of the Cleminson 6-wheelers. Photographic evidence  shows these vehicles operating together and as it seems unlikely that the Company would deliberately have allowed a numbering ambiguity, it seems probable that some carriage renumbering must have taken place. Further photographic evidence  appears to confirm that circa.1892 one of the Cleminson Brake Composites carried the number '10' apparently confirming that such a renumbering did indeed take place. However, as the number '10' was subsequently allocated to one of the Ashbury "Corridor" vehicles (1893) it seems probable that this first renumbering was a temporary measure leading to the eventual establishment of a more logical number structure for the NWNGR carriage fleet. The Board of Trade Order of 30 December 1890 under the Regulation of Railways Act had allowed 3 years for the NWNGR to instal Continuous Brakes on vehicles carrying passengers but the Company had managed to prevaricate, firstly over the 6 wheelers, until they were fitted, and then the 4 wheelers. Finally on 2 September 1896 J. C. Russell had to agree "to replace the three small coaches referred to at as early a date as the finances of the Company will permit, and to discontinue running the small coaches in any event by the 31st March next year." On 20th September 1897, Samuel Tanner, referring to a previous letter to Russell on the subject, wrote; "I beg to say that these were taken out of traffic some time ago and a new large Coach fitted with the Westinghouse Brake had been put into use in place thereof." This suggests the new Coach referred to is unlikely to have been any of the 8 coaches delivered 1891-94, but could have been the result of the £162 charged as Capital Expenditure under the "On Rolling Stock and Continuous Brakes" head in the second half of 1897 (expenditure on continuous brakes having been completed in 1894). This was what the previous 4 bought in 1894 had cost (a total of £649). With the withdrawal of the 4-wheelers Nos '3', '4' and '5' it is logical that the 1897 coach referred to by Tanner was given No '3'. This also fits with the 2 new Pickering coaches delivered in 1907 being given numbers '4' and '5' (as confirmed by the Pickering Order Book). Although no contemporary photographs of such a vehicle have ever materialised in service, it has been suggested that this might explain the "Mystery Carriage" photographed at Boston Lodge in the 1920s and 1930s. This carriage was clearly only suitable for quarrymen's trains (to Glanrafon Siding), quite logical if it was replacing the 4-wheelers. There was no adjustment of rolling stock totals in 1897 until 1909, although the withdrawal of the 4 wheelers was confirmed by the Continuous Brake returns. An alternative scenario is suggested by an affidavit by Russell to the Chancery Court in his role as Receiver and Manager in February 1893. He wanted to spend capital funded by an issue 'A' Debenture Stock, including "£550 in the purchase of two large carriages capable of carrying from 30 to 34 passengers each and to order one long frame on which to place 3 small carriages which are at present very ill-suited for the line and not very safe". The purchase of the two large carriages clearly went ahead in 1893 (becoming Nos 9 and 10), but did the conversion of the 4-wheelers still running as 'piped' vehicles 3 years later, which if 10 ft long would have produced a 30 ft bogie carriage, ever take place ? The £162 spent in 1897 could have been spent on this conversion. Possibly Tanner's letter was in coded language to prevent the B.o.T. asking further questions. One of these two scenarios was probably the dilapidated coach No 3 noted by Williams in 1923. Unfortunately the trail goes cold beyond this evidence. The entry in the Pickering Order Book confirms that these two carriages were given numbers '4' and '5' - why, if they were replacing nos '1' and '2'? As it is now known that one of the two Cleminson Brakes definitely carried the number '5' and as photographic analysis indicates that the All-3rd probably carried the number '6' ahead of the acquisition of the Pickerings  it seems almost certain that the other Cleminson Brake was number '4' and therefore it was these vehicles that were replaced by the Pickerings. The Cleminsons were operating on the Railway in the year it opened and the Director's statement in 1907 was thirty years after the event. The chassis from at least one of the Ashbury Brakes was still operable on the WHR into the 1940's demolition activities (see Note 1) and, referring to Aitchison's comment, his sentiment seems far more accurately to describe the Cleminsons than the technically superior Ashburys. Closed coaches 3 & 7 were described as "dilapidated" in 1923. It is claimed by Boyd that they were allocated numbers 32 & 34, but it seems more probable that these carriages never received WHR numbers. The FR purchased six open toastrack Hudson carriages in 1923, numbered 37 to 42. The cost was supposed to be shared but the WHR did not pay its share. They were used on both systems. Two replica NWNGR/WHR carriages have now been built and are in service. They are of a Carriage 24, a summer coach on the modern WHR and Number 9 a corridor coaxh on the WHHR. Additionally replicas are planned of a Pickering brake on the WHHR and an Ashbury brake on the modern WHR. ^ Boyd, James I.C. (1989). Narrow Gauge Railways in South Caernarvonshire, Vol. 2, The Welsh Highland Railway. Blandford: The Oakwood Press. p. 091. ISBN 0-85361-383-4. ^ Boyd, James I.C. (1972). Narrow Gauge Railways in South Caernarvonshire. Lingfield, Surrey, England: The Oakwood Press. ISBN 9780853611158. OCLC 707587. ^ Johnson, Peter (2002). An Illustrated History of the Welsh Highland Railway (2nd ed.). Hersham: Oxford Publishing Co. p. 020. ISBN 0-860935-65-5. OCLC 59498388. This page was last edited on 25 January 2019, at 13:16 (UTC).